This is the time of year that I find myself totally craving comfort. Wooly tights. Flannel sheets. Knit caps. Fuzzy sweaters. Heavy quilts. I think it’s because I get a little run down with work and all the craft fairs that pop up around this season. And craft fairs are hard work. I never realized how sore my smile muscles could get until I entered the craft fair circuit. It’s kind of a big change from working from home, let me tell you. Which reminds me, thank you to everyone who came around to my table at Got Craft this past Sunday! Thank you for saying hi and making me blush! And if you’re in Vancouver and want to pick up a few more paper doo-dads, I’ll be at Toque as a fundraiser for the Western Front this Friday and Saturday. And speaking of comfort, there’s something about this dish that seems like old-fashioned comfort food. Maybe because this dish is various shades of brown. 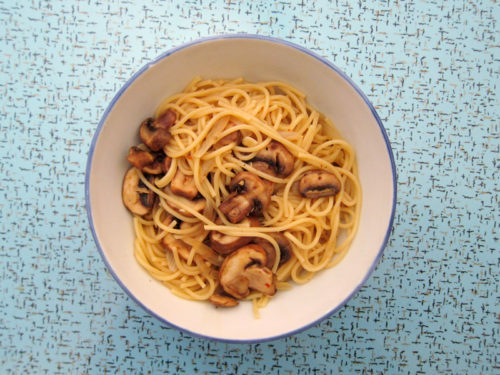 Or maybe it’s the pasta which is always welcome this time of year, but I think the meaty mushrooms lend some earthy appeal. Don’t skimp! I used baby ‘bellas here, but I think a good mix of wild mushrooms would really kind of make my mouth go wild in a good way. There’s lots of garlic and the caramelized onions add some nice sweetness. I wasn’t sure what kind of herb to throw in and when I spied a bottle of herbs du provence (a mixture containing fennel, savoury, thyme, basil, lavender, etc.) it just seemed like the right thing to do and it worked really well. Of course, I thought lemon juice would go nicely here and next time I might add in some of the zest as well for extra zing. When you’re run ragged with work and all the busy stuff that seems to crop up at this time of year, you need a little bit of comfort and ease around the dinner table. Even when that table is just the warm spot on the couch as you catch up on your latest tv craving. But just as this dinner is easy to whip up in about 30 minutes, it’s also perfect to serve at a casual gathering of your bestest friends. Just a bottle or two of your favorite wine and maybe some fresh parsley or basil to sprinkle overtop and you’re good. elsewhere: The other morning was chilly and I wanted something warming so I made a batch of delicious oat and nutmeg scones. They were perfect little bites of quiet happiness. Get the recipe over at Poppytalk. You won’t regret it. Meanwhile, in a large skillet heat olive oil over medium-high heat and add onion slices. Saute until soft and fragrant, about 5-10 minutes. Toss in mushrooms, garlic, salt, aleppo pepper and herbs de provence. Stir everything around until the mushrooms release some of their moisture. Pour in stock and let simmer and reduce slightly. How’s that spaghetti doing? Almost al dente? Then strain out most of the cooking liquid, but reserve about 2-4 tablespoons of cooking water with the spaghetti and toss the whole shebang into the skillet. Toss with the mushroom mixture, squeeze in the lemon juice, toss again, and serve in deep bowls with Parmesan cheese if desired. Pasta is my ultimate comfort food, for sure, and this is such a great reminder that I haven’t had it in far too long! Gotta get on that…tis the season for comfort, after all! Being a vegetarian I love new things to try. This sounds simple to make and yummy. Will try this tonight for my dinner. Mmmm, that’s my type of comfort food! 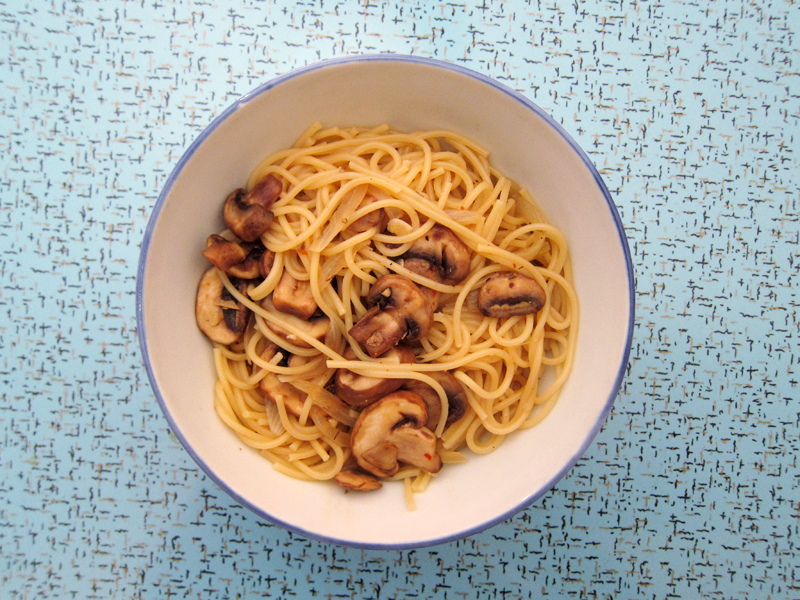 I love pasta and cheese, and the addition of mushrooms makes it so wintery and satisfying! I’ll definitely be making this dish– perhaps tonight! I know exactly what you mean about your smile muscles after craft shows! I always think I’m going to need to go home and put and ice pack on my face! : ) And pasta is always comforting and quick to make after a long day! Pasta is the absolute comfort food, in my opinion. 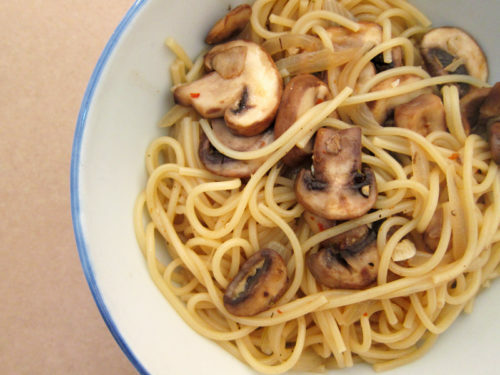 And combining it with mushrooms makes it all the more comforting! Lovely recipe. Thanks for sharing. Patricia, I’m sure you’ll love this – let me know how it goes! Cozy, I hope you give it a try! Jacqui, are you all done with your craft fairs for the year? I hope you did well! Yummy! I crave pasta too and I love mushrooms, so thanks for the recipe. I will have to try this on a night that my husband is out of the house, because he’s a non lover of mushrooms, funny how many men are-well the ones in my life anyways. Anything with mushrooms has got my vote! I know what you mean about the carb craving as of late. It has to do with shorter days and darkness, our brain chemistry and feel good receptors. Herbs de Province sounds like a nice yummy change. I went to Circle Craft and was looking to see if you were there but you weren’t! 🙁 Sadly I haven’t been to any of the other craft fairs this year though I’ve heard there’s been lots of amazing stuff. 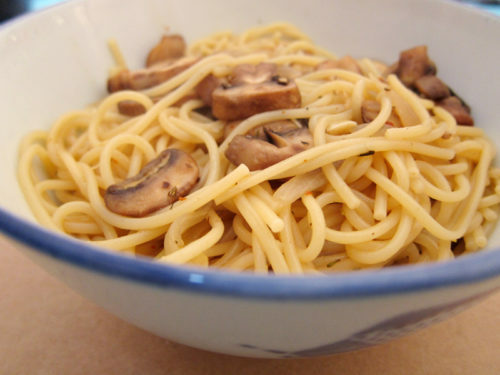 This pasta sounds yummy especially with the herbes de provence! Yum. Yum! I love portabella mushrooms! Couldn’t have said it better, Hayley! Ashley, no I’ve never done Circle Craft – though I did do One of a Kind for 2 years before deciding that I like the smaller fairs better. As for this dish, the herbs really work well here. I can’t think of anything more comforting than a bowl of spaghetti and mushrooms and a fuzzy blanket draped over my lap. Yum! Mmm, sounds so cozy, NicoleD! I made this. The lemon was an inspired idea; I used a meyer lemon from my backyard tree and I was very surprised that lemon complimented (but didn’t overwhelm) the other flavors. I used paprika instead of aleppo, and mushroom stock. All of this seemed to deepen the mushroom-i-ness, so to speak. My mother had a second helping, which is rare. Another winner from Ms. Pleat. Robert, so glad you enjoyed this! Mushroom stock would be great, I’m sure. This looks like a great Meatless Monday dish! Thanks for the idea. Smoo, so glad you all enjoyed this meal! I tried this recipe for dinner tonight, and although I did not have all the ingredients it was still amazing!! Not to mention a very simple and fast meal to prepare with amazing awards! For this pasta, I couldn’t find the “herbs de provence”, so I added what I could which was Sage and Rosemary. I also substituted the “aleppo” for Paprika, as Robert F above mentioned and the lemon added just the right touch! The mushrooms I used were baby bellas/criminis, a portobello and some white/button mushrooms. Thank you so much for inspiring our dinner! We will definitely visit again! Made it tonight and loved it! Mushrooms gave such a nice depth of flavour!